The Tel Aviv University campus is more than a place of learning and research – it's an entire universe – both in the academic sense of the word and in terms of the affinity between the physical campus and its intellectual activity. Named as Israel's most beautiful university campus in 2004 by the Council for a Beautiful Israel, Tel Aviv University's 200 acre campus is a unique open-air museum of modern architecture and plastic arts spanning the past five decades. The campus achieves a balance between beauty and function among its buildings, landscaping, environmental design and sculptures, many by renowned Israeli and international architects and artists. The use of sculpture as a key element in campus landscaping has been a guiding principle of TAU's Campus Art Committee throughout the years. From the minimalist International style of early Tel Aviv, to the concrete Brutalist style of the 1970s and onward, to the Post- and Neo-Modernism of more recent times, the TAU campus reflects the wide range of contemporary building styles all integrated into a harmonious setting designed by Dan Zur and L. Yahalom. The Wolfson Building for Mechanical Engineering designed by celebrated American architect Louis L. Kahn in the concrete Brutalist style and completed in 1980, is a site of pilgrimage for architecture enthusiasts from around the world. The asymmetrical and decorative adornment of the Jack Green Building of Biotechnology (1991) by Moshe Tsur expresses Post-Modernism's use of classical, contemporary and architectural elements. The George S. Wise Senate Building, designed by Yuval Cadmon, is a prime example of the Neo-Modernist synthesis of classical and contemporary stylistic elements. It features a sphere, by Italian artist Arnaldo Pomodoro (1984), one of the major works of art on campus. Reminiscent of a globe, the bronze sculpture symbolizes the universality of the human endeavor of learning. The monumental Sourasky Central Library building dominates the Schreiber Square, the central square of the campus. 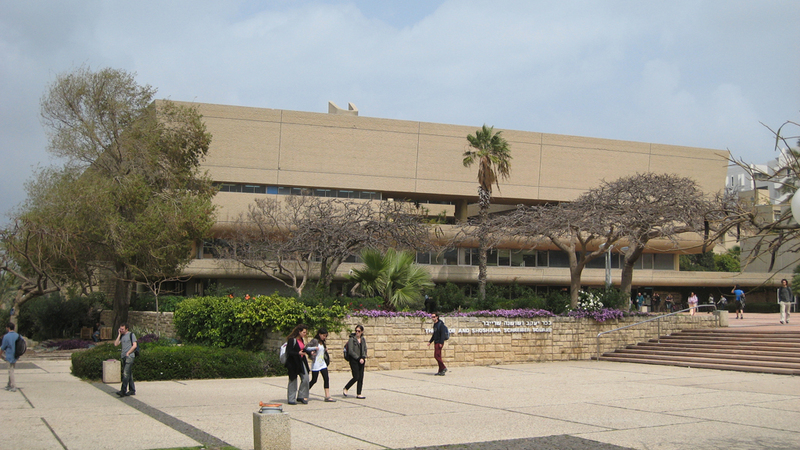 Completed in 1968, the building was designed by Shulamit Nadler and Moshe Gil and won the Municipality of Tel Aviv-Jaffa's Rokach Prize in 1970. It was commemorated on a stamp issued by the postal authority in 1974. The design achieves a delicate balance between all the elements of the structure. This is expressed in the relationship between the ground floor and the main library area which seems suspended in midair above it. 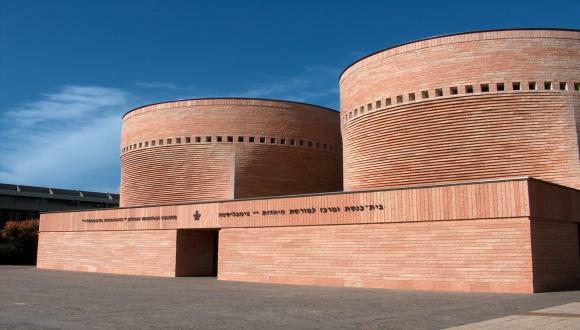 One of Israel's most unique works of architecture and interior design is the Cymbalista Jewish Heritage Center designed by Swiss architect Mario Botta. 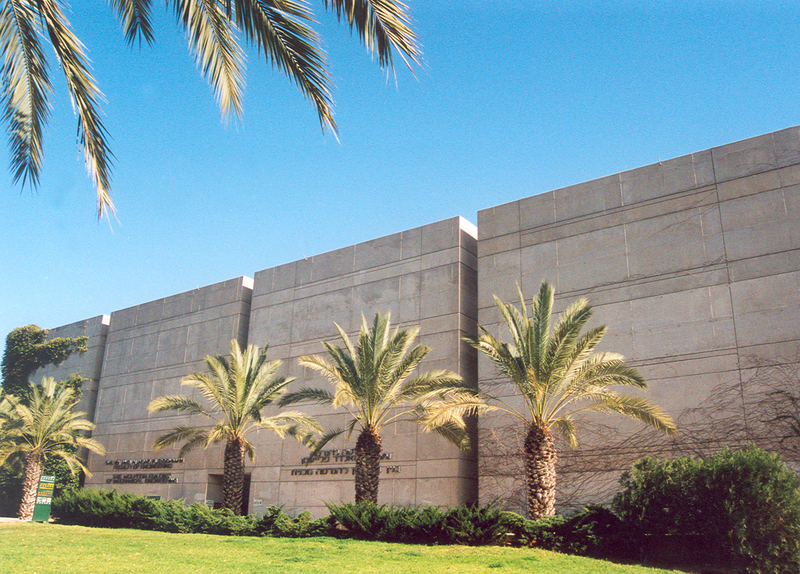 The Center's conspicuous twin towers, one of which houses a synagogue and the other an auditorium, reflect the secular and religious streams in Israeli society and the attempt to bridge between them. The Levi and Fortuna Ezkenazi Sculpture Garden, situated adjacent to the Genia Schreiber University Art Gallery at the main entrance to the University, comprises a collection of 30 outdoor sculptures donated by Italy's Giulia and Beniamino Matatia in memory of their parents, including the important works, The Wings of Peace by Carlo Zauli and Solar Stairs: Homage to Kepler by Giò Pomodoro. 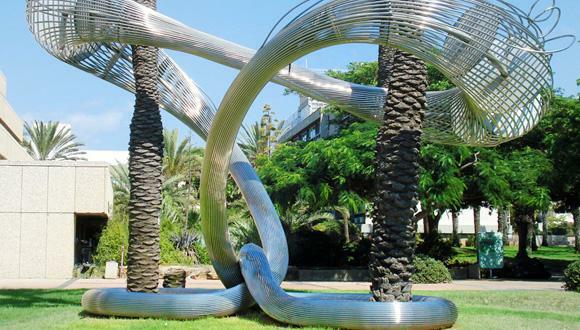 Located in the campus's central Jacob and Shoshana Schreiber Square, the monument Kesher ("Connection"), created by world-renowned designer and TAU Honorary Doctor Ron Arad and donated by Michel Benabou and the French Friends of TAU, commemorates Ethiopian Jews who perished on their way from Ethiopia to Israel. Depicting a bronze figure rising out of the ruins of the Holocaust, TAU supporter Varda Yoran's Shoah and Revival is situated in front of the engineering complex. On a similar theme but fashioned out of travertine stone, is Holocaust and Heroism (1990-91), by Emmanuel Hatzofe. Fittingly located in the Holocaust and Heroism Square in front of the Gruss Building, it is a gift of David and Fela Shapell, USA. The two parts of the monumental sculpture recall a mother protecting her child.